As mentioned before in the Rostering settings page, The Payboy software allows an alternative type of scheduling workflow which allocates employees to their shifts based on their available dates and times. 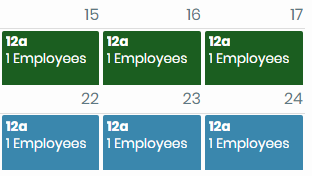 Enable employees to indicate their availability (i.e. date and time) easily to the administrator. Once the employee has indicated their availability, you will find their name during the process of shift scheduling.